We deliver right across mainland UK and Northern Ireland. Between 7am and 10pm. 7 days a week (yep, even on Sundays). For smaller items we can also deliver to the Scottish Islands, Isles of Scilly and the Isle of Man. ...Fab – you can beat the queues in-store and collect from our dedicated online collections counter. How do I extend my Click & Collect window? Can’t make it into the store? Need more time to go and get your items? No probs – you can extend your online collection window in the Recent Orders section of Your Account. For reservations, you can extend by an extra 2 days. And if you’ve paid online you get an extra 7 days. Just to note, you can't extend your Click & Collect window on Tu Clothing orders. Live Chat is available Monday-Friday 8am-9pm, Saturdays 8am-8pm and Sundays 10am-6pm. Do you use 2 man delivery for large items? Buy it today, use it tomorrow! Whether you need a new oven to save Sunday dinner, or a new sofa to seat all of your visiting family, we can help! 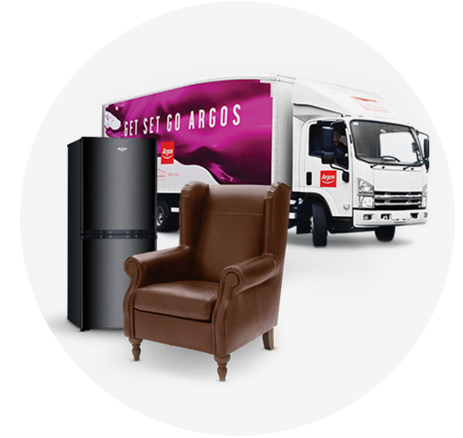 We have loads of large items and kitchen appliances available to enjoy from tomorrow, and we’ll deliver it directly to the room of your choice (providing our drivers feel there are no health and safety issues, like a staircase that’s too narrow or a danger of damage to your property). We can even take away & recycle your old appliance. If you’re having a product installed, we’ll contact you by email, SMS or telephone to complete a pre-installation survey before delivery. *During delivery trial periods some delivery options and prices may change. You’ll be able to see any delivery charges before you pay at the checkout. How does Fast Track delivery work? With our awesome Fast Track Delivery service, you can get same day delivery for just £3.95. It’s available 7 days a week for thousands of products. Result! When you pay for your order, you’ll get a choice of 4 timeslots. (The slots are: 7am-10am, 10am-1pm, 2pm-6pm, 7pm-10pm.) So you don’t have to spend all day waiting indoors. And… if you give us your mobile number, we’ll give you a 2-hour delivery window (we’re nice like that). There are 2 Click & Collect options when you shop online or on our app. So what’s the difference? If your chosen items are available to collect from a location near you, go to My Trolley and click Continue with Collection. You’ll then get an option to either pay now or pay in-store. If you pay now, you can enjoy Fast Track Collection and collect straight from our dedicated Fast Track Counter. Argos stores – You can pay online or pay in-store. Small Argos stores inside Sainsbury’s – You can pay online or pay in-store. Fast Track – You need to pay online beforehand. If you gave us your mobile number, you’ll also get a text. Bring your order details/reference number with you when it’s time to collect your item. If you’ve already paid, come on over to your designated counter. Go to the till (we accept cards, cash, vouchers… the usual). Here, you’ll be given an in-store order number. Pay at a kiosk (cards only) – just enter your reservation number and wait for your receipt to print out. Go to the Fast Track/eBay counter. Quote your order details/reference number from your email/text. How long do we keep items in store? Reserved items are kept until the end of the next working day. Fast Track, Click & Collect and eBay items are kept for 7 days. Can I extend my collection date? Absolutely! Just head to Your Account, go to the Recent Orders bit and then extend your collection date. With Fast Track Collection you can extend your date by a whopping 7 days. And if you’re reserving online and paying in store, you can extend it by 2 days. PS If you aren’t signed in while you make your reservation, you won’t be able to extend the collection date. Is everything available to collect? Not entirely – some products have to be delivered to your house, for instance if they’re too big. When you’re shopping, it will clearly say ‘Home delivery only’. Where do I collect in a Sainsbury’s store? The best thing to do is to wait for your 'ready to collect' email, which you'll need to bring with you in digital or paper form anyway. On this email you'll find all the details about telling you exactly where to go once you're inside the store (as well as the store address, opening hours and lots of other handy info!). Can I see all your delivery options? …This includes anything that can be carried by 1 person, like a toaster. Information on how your item will be delivered will appear on the product page. Order by 6pm and we'll deliver by 10pm. You get a choice of 4 delivery slots (7am-10am, 10am-1pm, 2pm-6pm, 7pm-10pm). Order by 8pm for next day delivery. We deliver Mon-Sat. £3.95 We deliver via trusted couriers. Order by 2pm on Mon-Fri for next day delivery. Orders placed from 2pm Fri to 2pm Sunday will be delivered Monday. £3.95 We deliver via trusted couriers. Subject to availability. Exceptional demand may restrict Fast Track Same Day Delivery availability. 90% UK coverage. We'll text you with a 2-hour delivery window the evening before or morning of your delivery. We also hold a small range of large kitchen appliances in selected stores. Just look out for appliances marked 'store pick-up'. PS All delivery options are subject to availability. What if I'm not in for a home delivery? Get in touch if you need to rearrange your delivery. We may not always be able to leave an order in a safe place or with a neighbour. A signature may be needed for high value orders or those delivered via our delivery partners. What if I order both large and small items? The quickest way to get them to you is with separate deliveries. (Don’t worry – you only have to pay the one delivery charge.) Just check your order confirmation email for more info. We deliver all across mainland UK and Northern Ireland. For smaller items we can also deliver to the Scottish Islands, Isles of Scilly and the Isle of Man. To find out if we come to your area, just enter your postcode on the page of the item that you want to buy. If you’d rather collect in-store, or at a local Sainsbury’s, use our store locator to find your closest collection point. Unfortunately, we don’t currently deliver abroad… but you never know what might happen in future.